Flu Season is Upon Us - Johnson Heating & Cooling Inc. If you are a homeowner who is not only concerned about the value of your Greenwood home, but also the health and well-being of yourself and your fellow residents, then you may want to consider making the proper investments towards ensuring that your are achieving the healthiest quality of air flow within the premises of your property. Unfortunately, there are a vast array of households that do not have quality air for breathing and living within their premises. What is the point of being inside one's home is there is no opportunity for breathing healthy air? If a homeowner and residents' health are at risk from living within the premises of a home, is it even worth living in that home? One's health should be a primary priority as it is one thing that we cannot get back if it becomes damaged. Let's take a look at some things that can be done to ensure that one's home is provided with the healthiest forms of air flow. 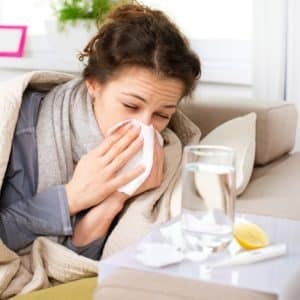 With the flu-season right around the corner, it is highly imperative to ensure that one's HVAC systems are cleaned, maintained and repaired if needed. Air filters should be cleaned out regularly as dust, dirt, and grime tend to accumulate in HVAC systems very easily. In order to ensure that there is an optimal amount of air circulation within one's home, the HVAC systems within one's premises should be cleaned by a professional to ensure that it will still be in proper working order after it has been cleaned out and placed back to its position within the home's fixture. A mistake many homeowners make in repairing or cleaning air filters themselves is placing them back in positions where they will not serve their purposes of filtering the air that is circulated within the interior premises of the home. If a Greenwood home's air filters aren't placed back in proper positioning within the premises of one's HVAC system, then there will be a greater amount of dust and grime lingering within one's property. This occurrence can and will cause a vast array of health implications for the residents living within the household. Be sure to contact your local plumber to have your property's HVAC systems and interrelated parts/components inspected and restored in accordance to their necessary repairs and/or servicing today! Keep your Greenwood, IN home free from germs of the flu season. Call Johnson Heating & Cooling today at (317) 881-7738, to get tips on how to keep your home flu-free.